Anthem’s gameplay, visuals, and audio make you feel like a superhero. Unfortunately, numerous bugs and severe network issues can quickly spoil the experience. I just want to keep playing Anthem. I can’t stop thinking about its satisfying action and vast world. Sadly, when I sit down to actually play it, I have to work my way through dozens of bugs and network disconnections that can quickly ruin my appetite for the game, even before I stepped into my Javelin. 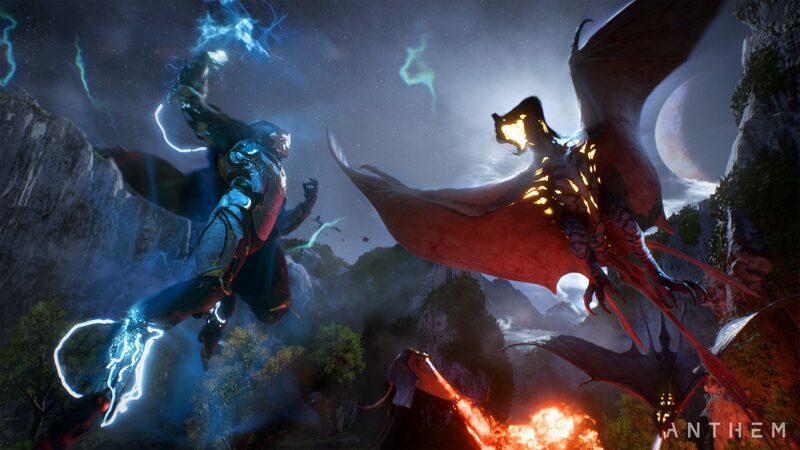 Anthem’s story takes place in a world where humans were not the first sentient beings to inhabit. The aliens that came before them, called Shapers, have left behind gargantuan terraforming relics that harness a mystical force known as “The Anthem of Creation.” The humans in the world of Anthem research and stabilize these relics to prevent disaster. You are a freelancer, one of the human heroes that use high-tech power armors called Javelins to stop the relics from going out of control. After failing to prevent a cataclysmic event called “The Heart of Rage,” the people have lost their faith in the freelancers. 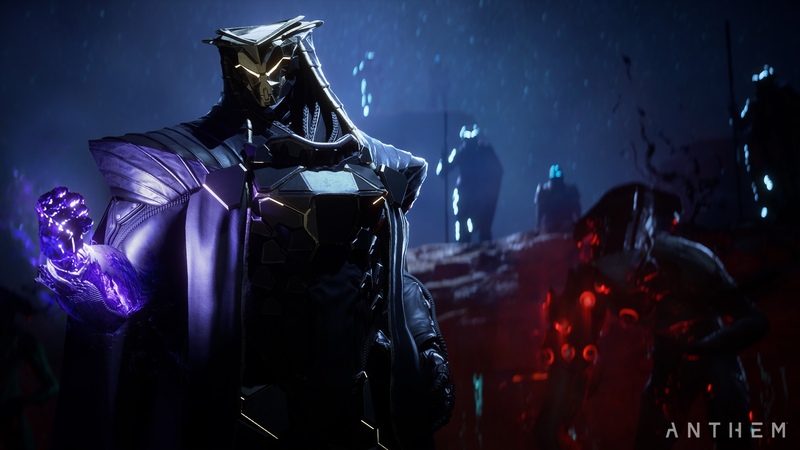 You now take on missions to redeem the lost pride of your profession and battle an evil army known as The Dominion, who want to harness the power of the Anthem of Creation for evil. Throughout the story, you’ll work for the various factions in Fort Tarsis, including optional side quests. While the final goal of the game is to collect exceedingly better loot, the plot becomes fairly interesting pretty early on. Even though the story is not as tangled or profound as in other BioWare franchises such as Mass Effect or Dragon Age, it’s the colorful characters that keep it vivid and personal. The different characters you meet during the story have unique personalities. Their charm is what makes you sit down and listen to what they have to say. It’s hard not to fall in love with these characters; like Owen, your young and reckless Cypher partner who accompanies you on missions and has a secret passion for sandwiches; or Brin, a socially awkward Sentinel who writes fan fiction of a radio show. The dialogues with the characters are very limited and don’t affect the story, but they’re a fun way to get to know the more interesting characters. You’ll spend most of the time interacting with characters in Fort Tarsis, which serves the same function as Mass Effect’s Normandy. Fort Tarsis is not very large, and you’ll probably explore it only once when you first arrive, and later go directly to the characters you want to talk. In Anthem, you fly around in a mechanized power suit like Iron Man. These Javelins divide into four kinds, each allowing for different playstyles. However, the game does not force you to play in a specific style with your Javelin, and you can choose abilities and equipment to match your favorite approach. Flying in your Javelin is one of the best parts of Anthem. The large map hosts giant waterfalls, caves, forests, ruins, and other fun places to fly next to, inside, or above. This sense of freedom is surreal. The game sends you scorching your way through different routes of the same large area, much like Monster Hunter World does. Even though you’re flying around the same map, the roads you explore make it feel different every time. When you finally reach your objective point, the game usually throws you into a firefight, and the different abilities, combined with the various weapons make almost every battle intense and exciting. The visual and sound effects accompanying your Javelin’s attacks and make them feel powerful, and the fights are balanced in such a way that allows every player to have their moments of glory. 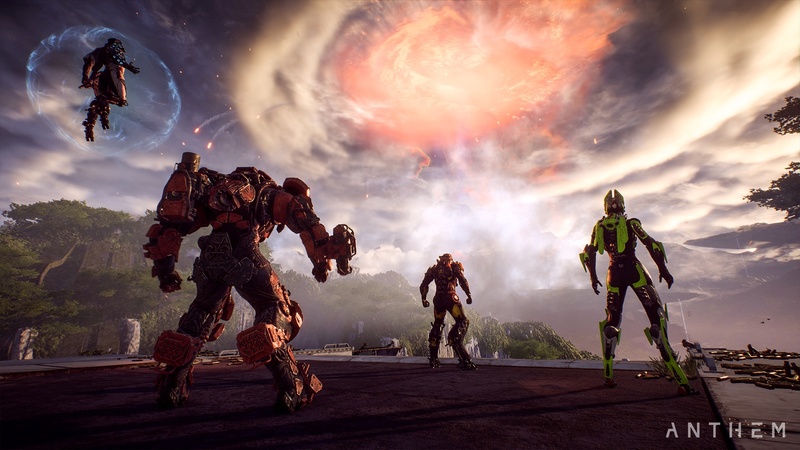 With the different suits, abilities, and Javelin personalization options, Anthem gives off a very satisfying feeling, like you’re part of a team of superheroes fighting against impossible odds. To earn this unique feel, you need to cooperate with other players, which works best when you’re four friends playing together and using voice chat. Coordinating with friends while pulling off cool tricks gives the most exciting co-op experience I had since Borderlands 2. The only thing stopping the battles from being even more intense is the lack of diversity in enemies and how they react. Most enemies you’ll battle look and act too similar to each other, with similar weak points and attacks. They also pause every once in a while and don’t seem to be very intelligent. The lack of feedback turns some fights into a repetitive chore, which is a shame considering how perfectly all the other battle mechanics and effects come together. 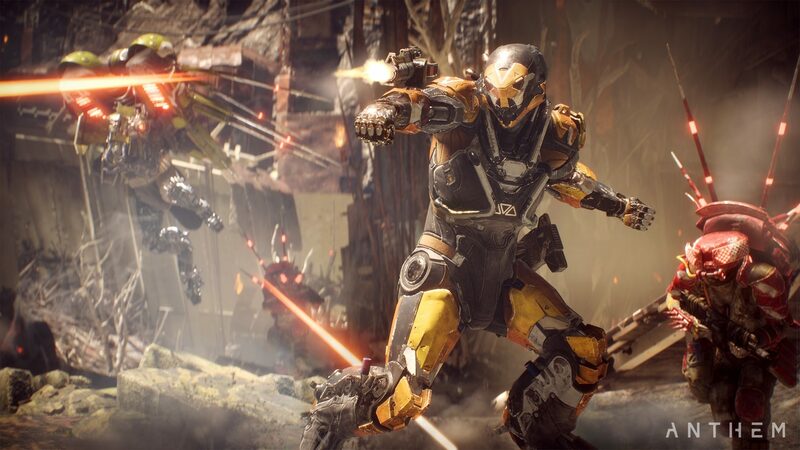 As a role-playing action game, Anthem lets you pick weapons, abilities, and armor components for your Javelin. With each mission, you will find new parts and weapons to upgrade your armor, in a way that makes you feel like you’re continually getting stronger. While it’s not as deep and complex as classic RPGs, it gives you just the right amount of customization to let you match your Javelin to your style. Anthem also gives you plenty of ways to visually customize your Javelin. You can pick the material and color of the different layers of your suit, add decals on top, and choose how dirty your Javelin looks. You can even select your entrance and victory animations. The game lets you purchase additional armor parts for customization through the store, which has a stock of visual items on rotation. You can buy these cosmetic items with in-game currency or real money. From my experience, throughout the length of the story, you will earn enough in-game money to buy two complete premium Javelin customizations. These items do not affect the gameplay itself and are purely cosmetic. I fell in love with the Frostbite engine while playing Star Wars: Battlefront II, with its lights, reflections, and simulated physics. With Anthem, it’s no different. The Javelins and their bright and colorful abilities make you proud piloting them, even with a group of complete strangers. The animations are the apex of the game’s visuals. They all give you a satisfying feeling, from the cool launch animation, through how your Javelin transitions from hovering to flying in a few precise frames, to the animation where you’re sliding down a small hill like a Gundam mech. These smooth animations help you believe that you are indeed piloting an advanced armor and are the most badass thing in the world. The different characters you meet throughout the story are animated using performance Capture technology, and their majority look great, with only a few seeming less ironed out. In addition, some of the characters you meet in the fort have short, quick, and looping animations, which can make them look like they are heavily caffeinated. The epic music makes a solid background to the action, and always seems to reach its best moments when you’re at the peak of battle. 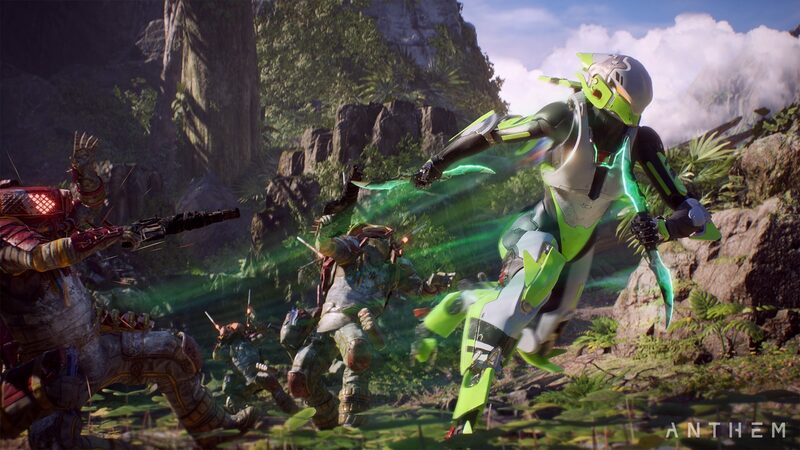 It cements the powerful superhero-in-action atmosphere that is Anthem’s bread-and-butter. The map you fly, run and operate in looks lifelike and very photogenic. It’s too bad Anthem doesn’t have a photo mode. 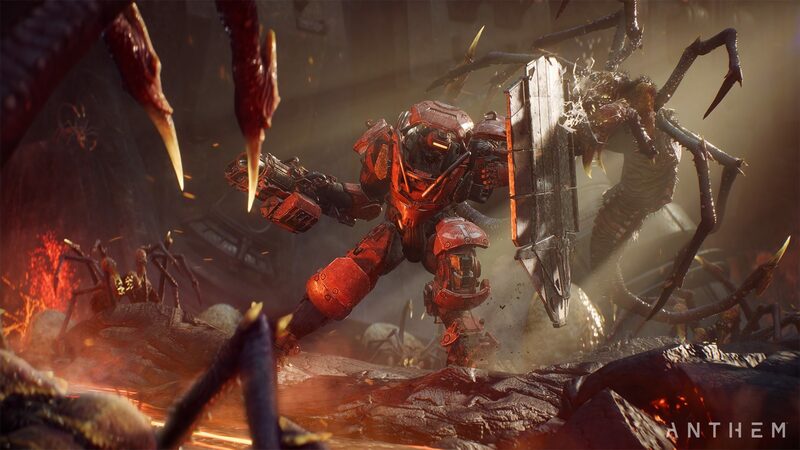 Right now, the biggest problem in playing Anthem is the ridiculous amount of crashes and disconnections the game is suffering from. These are likely to disappear within a few weeks, but for now, they turn the game from a fun experience to a test of patience. There’s nothing more annoying than starting up the game and then attempting to connect five or six times before you can successfully start a mission. Even having started one, it’s very likely that the game will kick you out before loading the end screen, and the gear you have collected will usually disappear or update only after a few more missions. Even when the game does not crash, other problems can rear their ugly heads and ruin the fun, such as assets not loading up. It easily breaks the immersion when one of your teammates walks around without a head. It’s these problems that can completely make you lose your urge to play, which is a shame because other than these issues, it is an enjoyable game. It makes one wonder if it was worth releasing the game on time, with all these issues, and not spend another month polishing it some more. I do not recommend playing Anthem at this time. To those of you who like the idea of flying around in an Iron Man suit, I suggest waiting until the development team resolves these significant issues. You will have a much better experience playing the game without these problems. I hope to return to Anthem in a few weeks and update you that the game is running as it should and that it’s your time you jump in and join the action. We’ll keep you updated.